“Tommy, I want you to go to the shops and pick me up some butter,” Mama said. 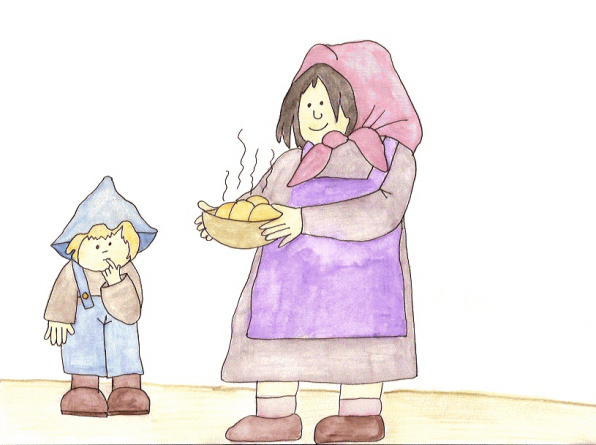 “I'm making hot rolls and stew for supper.” She handed her son a few coins and sent him on his way. He passed by a shop that sold ice cream. Pictures of chocolate, vanilla and strawberry ice cream cones were painted on the window. Tommy's mouth drooled. It had been such a long time since he'd had ice cream. He felt the coins in his pocket. “I could tell Mama I lost the coins and buy myself an ice cream cone.” He stood at the door, ready to turn the handle. “No, I'd better not. I'll get ice cream another time,” and he went on his way. The bakery was Tommy's favorite shop. He gazed through the window, seeing iced cherry cakes, flaky pastries filled with cream cheese and nuts, chocolate cakes covered with thick, gooey icing and apple struedels. “I could tell Mama I lost the coins and by myself a struedel.” He stood at the door, ready to turn the handle. “No, I'd better not. I'll get a struedel another time,” and he went on his way. He passed by a toy store and wanted to buy a yoyo, but kept walking. Soon he came to the grocers. He went inside and walked past rows of sweets. “No, Mama said to get butter.” He was almost to the back of the shop when he saw a man with balloons. He was standing by the fresh vegetables. Tommy ran over to watch. The man made him a balloon animal and did all sorts of tricks. Tommy was so excited her ran home to show his mama. “No, Mama. I wanted to, but I didn't,” Tommy said. “No, Mama. There was a man at the grocers and he made these balloon animals for the children. I've still got the coins.” Tommy pulled them out of his pocket. “Did you forget something, Tommy?” Mama held the bowl of hot rolls in her arms. “Butter? Oh no, Mama. I'll run to the grocers and get some right now.” Tommy dashed down the road to the grocers. He didn't stop and look in any shop windows. He was back home before the rolls got too cool. That night they feasted on hot rolls with creamy butter and a big bowl of stew. “Tommy, because you were such a good boy today, Mama's going to take you for an ice cream cone.” Mama took Tommy's hand and they headed for town. Tommy was so excited when he turned the door knob and went into the ice cream shop. As he licked the dripping ice cream, he felt glad in his heart that he'd done as his mama had asked.